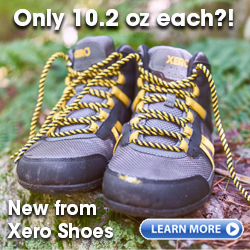 Xero Shoes is a company that believes in feet! Feet are our foundation and what get us around. So why are we wearing footwear that doesn’t embrace the natural way our feet move and perform? Your feet are meant to bend, to move, to flex, to Feel The World®. Xero Shoes let them do that. Your sole is the foundation for your body, and our patented FeelTrue® soles are the foundation of all our shoes and sandals. They let you connect to the world, give you just-right protection, and are durable enough that they have a 5,000 mile sole warranty. Check out our review of the Prio by Xero Shoes here.